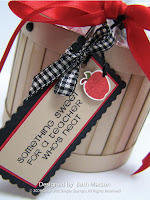 The beginning of the school year is just around the corner so what a great time to get started on some teacher apprecation cards and gifts. This set is perfect for all of those teachers in your life. Here's one of the cards I made using the new A+ Darling set. I stamped the Darling image on Kraft cardstock with Palette Hybrid black ink and then colored the image with Copics (including the chalkboard). Next I stamped the verse on the chalkboard in Colorbox Frost White pigment ink. I used a white gel pen to color in the piece of chalk in her hand. 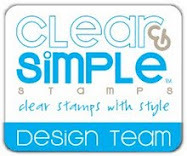 In addition to the new Stamp of the Month it's also time for a new template of the month. Fellow design team member Sue Berker really outdid herself with this month's template. She created the cutest apple basket pattern ever! You can download the free pattern here. 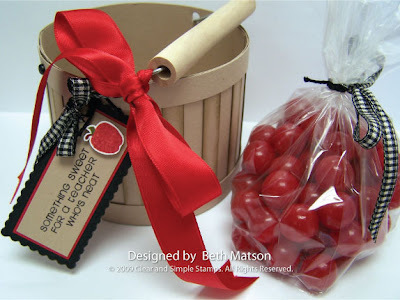 Be sure to check out all of the design team members blog's for more samples of the apple basket plus sneak peak's for the Clear and Simple Stamps School Days Release happening on August 15th. 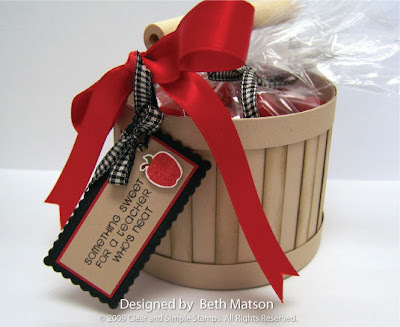 The wood handles for the basket template are available at Clear and Simple Stamps. Let me know if you make a basket and leave me a link so I can check it out. Thanks so much for stopping by. I hope you're having a wonderful weekend! Love everything, Beth. Your card is wonderful. Awesome projects!! I love what you did! Darling card and I want to eat those cherry sours (assuming that's what they are). Great basket! Very nice projects!! I am one of the guest designers for this month and have linked your blog to mine...just FYI! I like your project and it seems to me different from the others. Thanks or sharing with us. Keep adding more and more in your lists.